. With today’s release of Google Maps 6.7 for Android in the U.S., you can see all the Google Offers near you in list or map form, making it easy to get great deals from local businesses on the go. The next time you’re looking for things to do or places to eat nearby, open Google Maps for Android and see if there’s an offer nearby. Tap “Maps” to open the dropdown menu and then tap “Offers” to see offers on your map. You’ll see all the businesses offering deals near your current location, marked with the blue Google Offers “tag.” You can also view these offers in a list and choose to get notifications for offers nearby, so you’ll never miss a great deal. 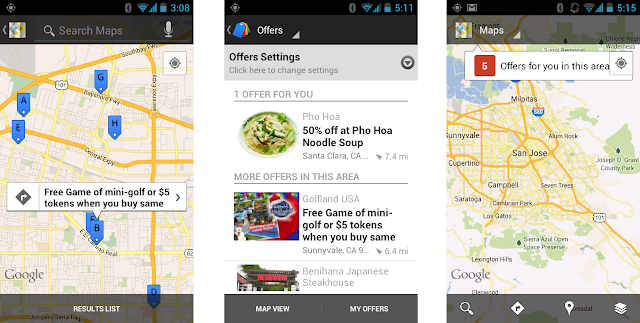 Browse the available offers in maps or in “results list” and get notifications for offers nearby. If an offer catches your eye, click on it to learn more. 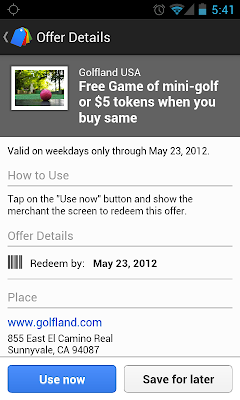 You’ll see offers that can be purchased for later use and offers that can be used instantly for free. For these offers, just tap “Use now” if you’re ready to redeem, then show it to the nice person behind the counter when you’re ready to check out. 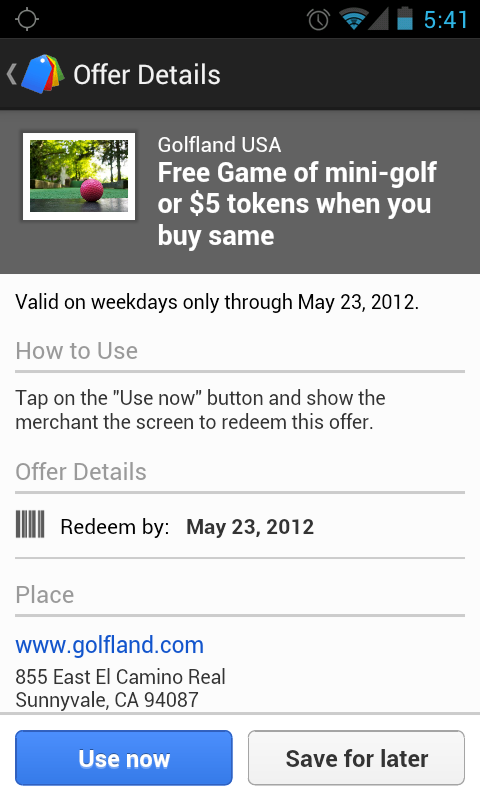 All of your saved or purchased offers can be found in the “My Offers” section of Google Maps for Android, or on the Google Offers homepage. So, the next time you’re zooming around town, put your street smarts to work and uncover the great deals and discounts around you using Google Maps for Android. Whether you’re navigating the streets of your hometown or exploring a new city, getting from “point A” to “point B” is a breeze with Google Maps for mobile. With today’s release of Google Maps 6.7 for Android in the U.S., you can see all the Google Offers near you in list or map form, making it easy to get great deals from local businesses on the go.